unitech south park, sector 70, gurgaon, a photo by guptapromoters on Flickr. Unitech has launched a new project called Unitech South Park in Sector 70 Gurgaon, roughly a 1 km off the Sohna road. 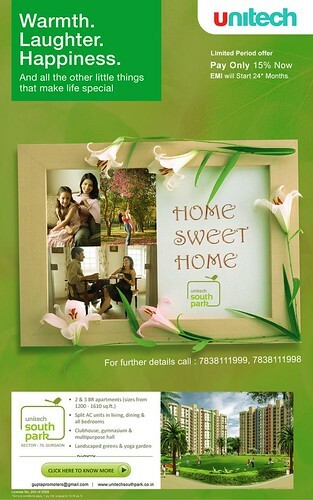 Unitech South Parkoffers 2bhk & 3bhk apartments at varying in sizes 1200 sq ft. to 1610 sq ft. at very unique prices. It will belong to the most prestigious neighborhood of the 150 meter wide Golf Course Extension Road which shall have the metro running through it.